We drove to New York City this weekend to work on our daughter's apartment. Manhattan seemed to be rebounding quickly from Hurricane Sandy so we went ahead with our plans. 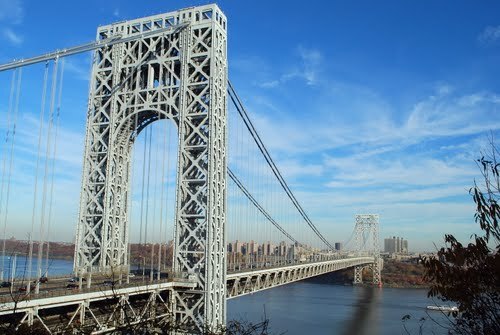 We entered the city via the George Washington Bridge from New Jersey, so much easier than using the Lincoln Tunnel which requires scary aggressive driving. Traffic was not a problem on a Thursday evening. Getting a free parking space in the Upper West Side was also not much of a challenge, usually takes just a trip around the block to find one. I love the UWS. Quiet (honking is prohibited, a $350 ticket), wide streets, wide sidewalks, lots of trees and close to Riverside Park and Central Park. 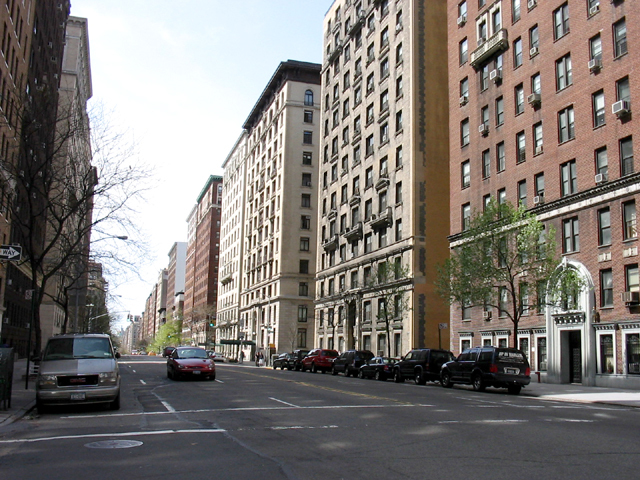 She lives on West End Avenue, within walking distance to her work at Hearst in Columbus Circle. I should have taken Before shots, completely forgot as usual. We started with the closet. Took the door off which created new wall space and made it easier to access her clothes. Hung an unused white linen panel from our home. Big difference and easy. Oops, missed a spot when I ironed it. Bought a new wood dresser from Nadeau, a great source for solid wood furniture in many different styles. It is a growing chain in cities all over the US. NYC store is south of Union Square. Brought set of porcelain lamps from home for lighting and an antique mirror bought years ago. Found both the big brass bottomed vintage bowl for makeup and a monogrammed tissue cover on Etsy. Must buy flowers first thing when we get to the city at the little bodega on the corner of her block. Brought the orange Anne Harwell chair print from our house and combined it with her artwork for a little gallery over the dresser. Needed to create space for the jewelry, used the bedside table wall and went vertical. Bought the velvet display pieces from Michael's. Hung her drawing bought from a street artist in Paris to add interest to the wall. Brought the gold leaf earring holder from her bedroom at home. On the window wall, we used a wood blind from the clearance shelf at Home Depot (for $7!) combined with floating shelves from the Container Store for stilettos and clutches. Rest of shoes are crammed into closet. Look out the window...trees! And protection, the apartment faces the courtyard, they thought the Hurricane was minimal until they heard the news and went to work and heard the stories of colleagues. The little succulents and pots came from the Ikea in Brooklyn as did the drill and hardware to hang the blind and shelves. Little objects from her travels. Lucky girl she is. Hung purses on two Ikea hook hangers with room to store the all important nail polish collection! She has access to amazing beauty sales several times a year at Hearst where most products are about a dollar, therefore she has a huge collection. We installed the hooks with the Ikea drill and without a level while husband and brother napped upstairs in the living room while watching football. We were proud of ourselves but there was a bit of cussing involved. Did not help that the two hook racks were not identical in size, uh, quality control please Ikea! She painted her bed wall bright orange. She does not want a headboard as there is only a few inches of open space between the wall and the end of the bed so we hung a set of Paris prints from her bedroom at home instead. Actual color of the wall paint is in the above photo. One below has glare from the lamp. 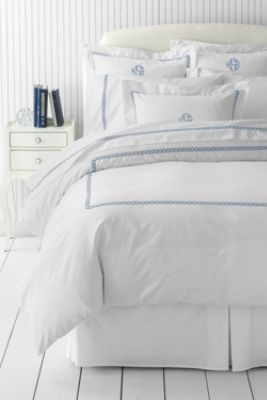 Bought duvet and monogrammed euro shams from Lands End but the shams are back ordered for delivery this week. Imagine these instead. Geometric lumbar pillow is from Etsy. Fluffy pillow I think she bought at West Elm. We squeezed in visits to the 911 Memorial at Ground Zero and the Met on Saturday, those posts to follow. Oh, here is their cute little kitchen. The dish drying rack is on top of the fridge with a Target melamine tray for catching drips. The heart Kaj Franck bowl and set of Lazzaroni amaretti cookie tins are from Etsy, bought several years ago. Posters and postcards from the open air vendors on the Left Bank along the Seine in Paris. The black coated wire shelf from Bed, Bath and Beyond. To see the upstairs living room and balcony, go here. Nice work, Cindy. You really made the most of the space and made it very stylish!